Okay, it's the weekend and I refuse to be bound by the moral high-ground of blogdom, specifically the pledge that I will post no ads. 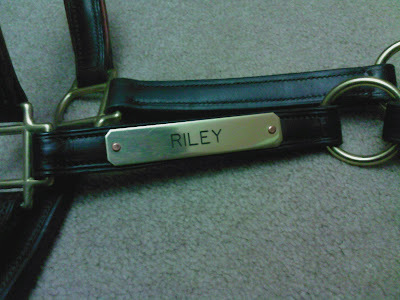 I bought a great halter at the Rolex Three Day Event Trade Fair in April -- my dream halter, butter soft and the perfect color piping for Riley (or any chestnut). 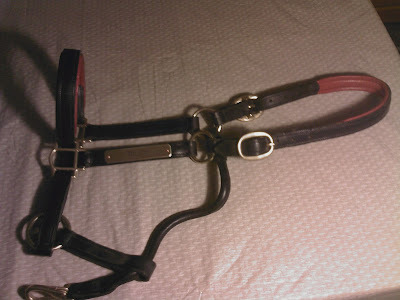 It's horse size, new, black leather with rich amber piping and brass fittings. Alas, he never actually wore it. I remember trying it on him in April, and the crownpiece was on the last hole on one side, the second to last hole on the other. I reasoned that the next size larger would have been too big. Now, 9 months later, I cannot fit it on his head on the last holes. 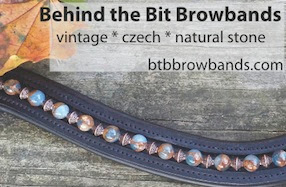 In the photo, the piping looks orange but it's really a rich amber, perfect for chestnuts, nice for bays and blacks (who could wear any color), but maybe not the right choice for greys. The leather is butter soft. The coup de gras is, it's personalized. Note the name plate that says "Riley." That can be changed of course. And Gentle Readers, please don't think I'm a total sellout, targeting my sales effort to a captive audience of BTBers. This is just an easy way to post the photos for the ads I'll be putting on Craigslist etc. Wish me luck! Crownpice is 24" end to end; top of noseband, not including hardware (leather only): 12.75"; side/cheekpiece is 7" leather only; throatlatch is about 15"
Riley's head is nicely shaped but it is huge. I think this would fit the average 16.2 TB type head. I'm a little disillusioned with Ebay -- no longer a place for great buys and the fees are a bit much. Plus, I've tried selling halters there, they just don't move. 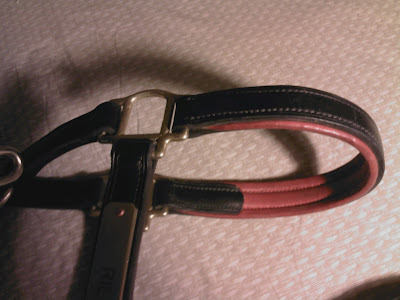 I just wrecked my leather halter and need a new one and this one is GORGEOUS!!! Sorry, it is sold now! oh crap. Oh well. too slow.